Image credit: All images and graphics are the property of their respective owners. Were a movie to be made about the goings on in the local craft beer community, it might very well share a name with a series of action films known as The Fast and the Furious. Despite the majority of the industry being less than three years old, growth continues at a frantic pace as brewers are doing everything they can to put more beer in the hands of thirsty North Texans. The dizzying nature of it all means it's getting harder and harder to keep up. 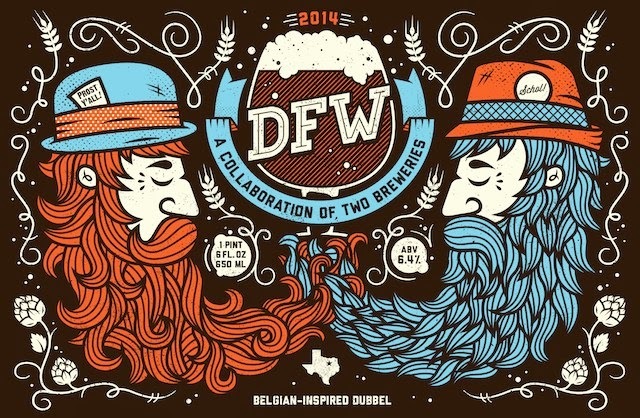 Can anyone say they were able to try each and every new beer introduced by North Texas brewers in 2014? I know I can't, but at the same time I certainly wouldn't wish to go back to a time when our choices were limited to only a handful of locally crafted brews. Still, in light of everything that's happened, it's somewhat amazing to consider the local industry's youth. Seven production breweries and one brewpub celebrated their first anniversary in 2014 and, barring setbacks, six breweries and a brewpub will do the same in 2015. On top of that, at least a dozen more brewing operations are in the works, with a fair portion of these poised to open in the very near future. That notwithstanding, you can't help feeling like a sense of stability has been brought on by the long-term success and continued popularity of both Franconia and Rahr & Sons. Franconia celebrated its fifth anniversary during 2013, while Rahr marked its tenth year this past fall. In fact, Rahr's accomplishment is historical in that the brewery is the first to stay in business for at least 10 years during the microbrewing era. That era, for those that are interested, began in 1976 with the opening of New Albion Brewing Company in Sonoma, California. Even more impressive, Rahr is now also the longest sustaining "local" brewery since Prohibition (in other words, we're not counting Miller), beating out the Dallas-Fort Worth Brewing Company which existed from 1941 to 1951. And, to top it all off, Rahr brewed its 1000th batch over the summer, while also working with Lakewood on DFW, the first ever collaboration between North Texas brewers. Speaking of beer firsts, it's also worth mentioning the release of Rubberneck Red, a joint effort from Martin House and the Toadies, as well as Franconia's Tripel Dunkel, named as the Ticket's top beer of North Texas Beer Week, and Community's Funnel Cake Ale, which was brewed exclusively for the State Fair of Texas and also won Most Creative in that event's food competition. So, what else? Where do we go from here? Many still say the sky is the limit, and while that may be the case for now, the industry did experience its first closings from among the new breed of brewers during 2014. Retail and tap space isn't infinite, and with new beers being released constantly by both local and national breweries, competition will only get tougher. Confucius say: Those yet to enter the market should probably have a good business plan to go along with a recipe for good beer. 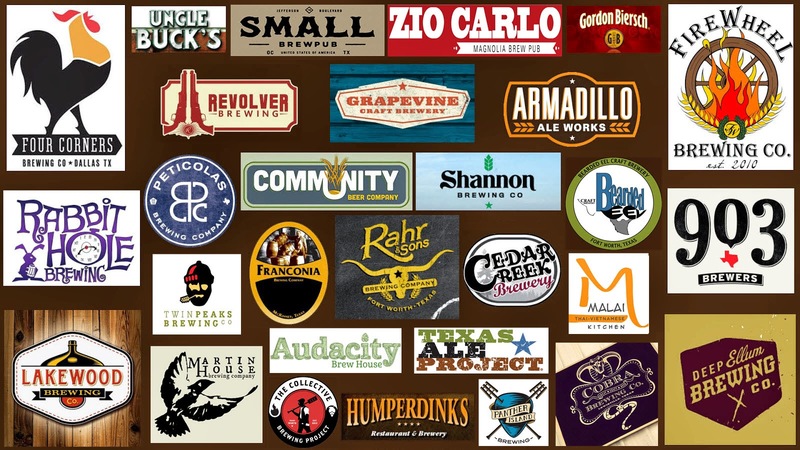 Last year at this time, there were 16 production breweries operating in North Texas. Now, twelve months later there are 21. Newcomers include The Collective Brewing Project, Panther Island, Shannon Brewing, Audacity Brew House, Bearded Eel and the Texas Ale Project. If you're doing the math in your head, you may be thinking those numbers don't quite add up, but remember we also lost a brewery this year after Independent Ale Works ceased production in Krum. There's hope for fans of Indy, though, as some beers may re-emerge as part of the Muenster Brewing Company expected to open sometime next year. As for brewpubs, the December opening of Small Brewpub in Oak Cliff represents the first new entity of its kind to open in Dallas since Union Bear, which as it turns out closed its doors in September. It too may rise from the dead, however, after the concept was purchased by the 33 Restaurant Group, who says they'll revive the Bear if a suitable location can be found. Elsewhere, two area restaurants added brewing operations early in the year, as small-batch brews are now on the menu at the Malai Kitchen in Dallas, and at Kirin Court in Richardson. For a little historical perspective, see the chart below. 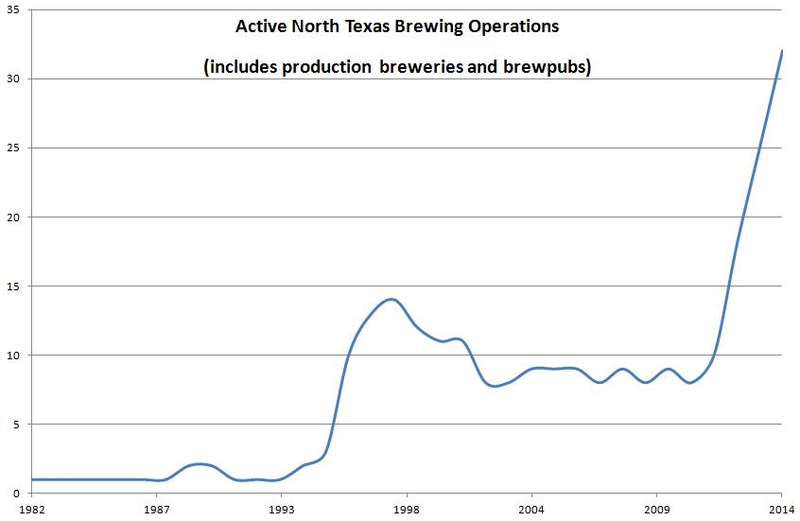 As it stands now, North Texas has more active brewing operations than at any other time in history. North Texas craft brewery opened in 1982 (Reinheitsgebot Brewing Company of Plano). Want more? You'll get more with the expected openings of Bitter Sisters, Four Bullets, Nine Band, Noble Rey, Braindead, 3 Nations, On Rotation, Tupps and Intrinsic Brewing. The last of these is the only one that has yet to begin actual construction, while 3 Nations will assume control of Grapevine's current facility once that company moves from Farmers Branch. Whether it be Deep Ellum raising their roof to make room for additional capacity, or FireWheel moving to a more expansive building in Rowlett, nearly every local brewer has taken steps to produce more beer going forward. New tanks were brought online at 903, Cedar Creek, Four Corners and Franconia (and likely others), while Armadillo found a home in Denton, and Grapevine began construction on a permanent address in its namesake city. Of all of the moves, though, perhaps the most ambitious one was made by Lakewood. In April, the brewery revealed it had acquired an adjacent lot upon which it planned to build a new 14,000 square foot facility, which when added to their current allotment of 11,000 square feet would more than double their overall operating space. Not only that, it was noted that annual production numbers were expected to reach upwards of 80,000 barrels in the next five to ten years. In terms of packaging, Four Corners made news by becoming the first in Texas to debut cans featuring the fully removable 360 End™ lid, an innovation that will be adopted by 903 once they transition from bottles to cans early in 2015. And speaking of 903 (bombers), this year they joined Grapevine (cans), Shannon Brewing (bombers) and Rabbit Hole (750mL bottle) in being among those who packaged and sold their beers at retail for the first time. As for others, Rahr & Sons opted for aluminum after years of only bottling with the release of Rahr's Blond and Pride of Texas Pale Ale in cans, while the Collective Brewing Project became the first North Texas brewery to offer take-home beer in crowlers. Up next? In the coming months, look for Rabbit Hole to offer their year-round beers in cans and for Cobra to begin selling bombers of select brews in their portfolio. With medals awarded at both the World Beer Cup (WBC) and Great American Beer Festival (GABF) in 2014, North Texas brewers continue to make a name for themselves at major competitions. A total of nine medals were awarded between these two events, including 5 gold and 4 bronze. Going back just three years, which encompasses the time period of the local craft beer boom, area brewers have brought home a running total of 13 medals (8 gold, 1 silver, 4 bronze) from the WBC and GABF combined. Gold - Armadillo Quakertown Stout, Community Public Ale, Grapevine Sir William's English Brown Ale, 2012 Peticolas Great Scot! Prizes were also awarded this year at the United States Beer Tasting Championship (Community, Lakewood, Peticolas, Rahr & Sons, Revolver), the United States Open Beer Championship (Community, Lakewood, Peticolas, Rahr & Sons) and the Los Angeles International Beer Competition (Community, Rahr & Sons). Just in case you're new to the blog, I'll give a quick rundown as to how I choose to cover the year in beer. Given that I don't try every single beer to appear in our market over the course of a year, I don't really believe in the idea of a "best of" or "top ten" list. That said, there are always a few beers I enjoyed more than others, so I tend to just jot those down and present them in my own way. The only stipulation being the beer has to be "new," meaning it was either brewed or sold in the state for the first time in 2014. Some of what's new, of course, gets drawn from brands newly distributed to North Texas. A list of such products might include Atwater, Champion Brewing, Elevation, Epic, Fish Brewing, Foolproof, Hermitage, Humboldt, Jolly Pumpkin, Kentucky Ales, Mission Brewery, Nebraska Brewing, Odell, No-Li, SanTan and Smuttynose. Of course, that doesn't include new products from either overseas or Texas breweries outside the Metroplex, but I'm not sure I could compile a list of them all if I tried. Maybe the most talked about local beer of 2014, Sir William's first gained notoriety after being named the best beer in Dallas by D Magazine. From there it went on to be named Best in Show at the Best Little Brewfest in Texas prior to winning a gold medal at the Great American Beer Festival. Award-winning or not, it's the flavor and complexity of Sir William's that makes it destined to be part of my regular rotation. Flavors reminiscent of cocoa powder and chocolate syrup are backed by hints of roasted malt and a nutty character that comes out as the beer warms. It's malty with a medium body, light esters and a smooth finish. In other words...who says brown ales have to be boring? Much like Alfred Brown, another brew from Peticolas that took this category last year, Irish Goodbye is representative of a style of beer I enjoyed when first starting my exploration into the world of craft beer. Categorized as an Irish red, this beer is a low gravity, malt-focused brew featuring caramel, toffee and a hint of roasted grain. It's an ale, but is clean like a lager with minimal esters and only a faint finishing bitterness. As the header suggests, should you find yourself enjoying a pint of Irish Goodbye come March, the first words that should come to mind are "to style." If for some reason they don't, or if you don't otherwise think this beer is a liquid rendition of the style guidelines, you need only ask yourself one question: Are you sure you're drinking the right beer? Like the commercial description says, Dissenter is an exceptionally clean beer with bright, fresh citrus and tropical fruit flavors. Hop-forward with ample strength, this India pale lager is arguably more flavorful than some IPAs. The contradictory nature of a black pale ale aside, Dark Penance may be the perfect example of what a black IPA should be. Rather than trying to balance the richness of dark roasted malt with huge hop flavors, Founders chooses instead to simply change the color of what would otherwise be a stylistic IPA by using Midnight Wheat. This particular grain adds the requisite color with only a subtle hint of flavor and none of the astringency that can sometimes be introduced with roasted malt. Pour yourself a glass and cue the Rolling Stones..."I want it painted black." There are more barrel-aged beers on the market than I care to count (evidenced by the lengthy runner-up list below), but if there was one beer I kept coming back to time after time in 2014, it was Epic's Big Bad Baptist. A beer with rich coffee flavors and layered dark chocolate, I've purchased numerous bombers with the intent on aging a few, but I just keep drinking them. Thankfully, this beer can still be found on shelves around town, so maybe...just maybe I'll manage to stash one away before they're all gone. Also notable: Firestone Walker Stickee Monkee (bourbon barrels), Humboldt Black Xantus (bourbon and wine barrels), No Label Perpetual Peace (bourbon barrels), Harviestoun Ola Dubh 1991 (Scotch whiskey barrels), Community Bourbon Barrel Aged Glenstemmons, Kentucky Bourbon Barrel Ale. An imperial golden stout brewed with thirteen different ingredients, Brunch Money was far and away the most interesting beer I tried all year. The beer is well-executed, to say the least, considering how Armadillo was able to maintain balance while bringing together flavors of coffee, cacao nibs, lactose, maple and vanilla. You won't convince me it tastes like waffles or pancakes, given that I don't really pick up any doughy elements, and it might better be billed as a pale stout (it's more of a ruddy amber color), but of all the North Texas beers newly released in 2014, I can't think of another I've enjoyed more. Going by the book is not something consumers expect of modern craft brewers, but in a way the Rabbit Hole Brewing Company of Justin, Texas is doing exactly that. Except that the book in question doesn't have anything to do with style guidelines or rules governing what you can or can't do when it comes to craft beer. Instead, it has to do with molding the brewery's image around a novel written by Lewis Carroll known as Alice's Adventures in Wonderland. Knowing this, it should come as no surprise to learn that the brewery has done something quirky and, of course, crafty to celebrate its first anniversary, while adding a twist to a particular tradition of the holiday season. As the King of Hearts suggests on the label of Rabbit Hole's newest creation, leave the champagne behind, for now you can ring in the New Year with a glass of Hole Lang Syne. 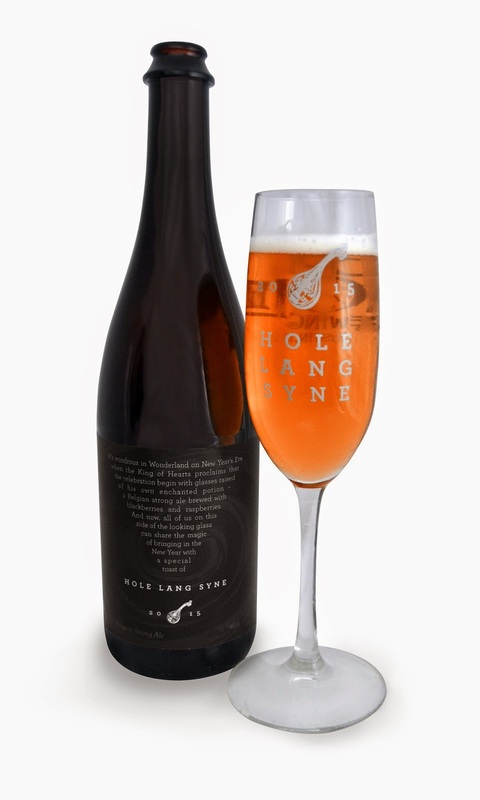 Brewed especially for end-of-year celebrations, Hole Lang Syne has been released on draft and in 750 mL bottles. It's the first product out of the brewery to be packaged and sold at retail, being limited in that respect to 608 hand-numbered bottles (an amount, oh mavens of the curious, that was chosen to match the number in the brewery's address). As for what's on the inside, Hole Lang Syne is an amber-colored brew with rosy hues, brisk carbonation and an aroma built upon infusions of raspberries and blackberries. A scent of perfume seems to permeate the fruit, at least at first, evolving somewhat to being not unlike that of freshly-picked flower petals. In terms of taste, the fruit is more forward, lingering along with an underlying sweetness and hint of spice throughout. Malt flavors are soft and supportive, something typical of a Belgian Golden Strong Ale which forms Hole Lang Syne's foundation. The beer has a mild tartness, which comes about on the back end as it finishes with a dry palate, slight bitterness and a persistent alcohol warmth. The latter being the result of a 10% ABV, which falls in on the high end of what is typical for the style (7.5 - 10.5%). While clearly noticeable, the boozy tone is smooth and well-rounded as opposed to being hot or solventy, and is therefore right in line with established guidelines. Judging the appeal, fans of fruit beers will find a lot to like here, though I'll admit my personal preference would be for the sweetness to stand down a bit more. Nevertheless, should you choose to forego the traditional champagne toast at midnight on New Year's Eve, Hole Lang Syne offers something warm, fruity and no less effervescent than the standard bubbly. If you've yet to try it, bottles are likely long gone, but Hole Lang Syne will be on tap at a number of New Year's Eve festivities around town. Check out happenings at The Bearded Lady, Addison Flying Saucer, Midway Icehouse and Espiritu Fine Wine, Ale & Spirits. I guess Forrest Gump was right when he said "Life is like a box of chocolates," since one look at Shiner's latest offering will have you thinking, "you never know what you're gonna get." The quote is appropriate because earlier this week I received what was, in effect, a box of chocolates from the Spoetzl Brewery and their brand manager McGarrah Jessee. It was a gift of sorts, to help celebrate the brewery's 106th birthday. Of course, one might have expected to look inside and find a traditional German lager, but much to my surprise the contents revealed Shiner's new chocolate stout. Needless to say, based on past history, it wasn't what I thought I was gonna get. Birthday Beer, a.k.a. 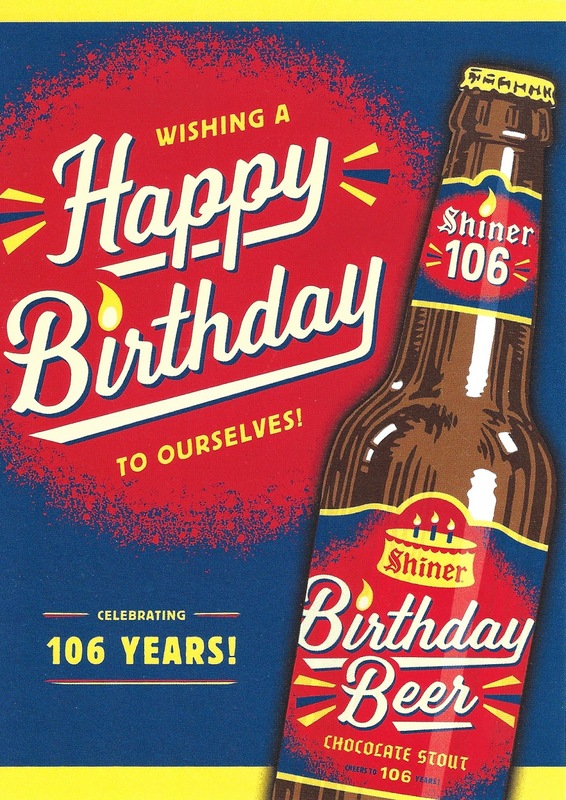 Shiner 106, is a limited-edition creation brewed in small batches with chocolate malt and real cocoa. It's the first stout produced by Shiner, coming a little less than three years after the brewery crafted its first ale in Wild Hare Pale Ale, and a further departure from their traditional line of lagers. As for the number designation, in addition to referring to the number of years Spoetzl has been in business, it's a continuation of a series of annual releases that began with Shiner 96. Samples of Birthday Beer arrived in a gift box, appropriately wrapped in paper with a birthday party motif. An accompanying card, depicted in the image above, described the beer as having "a distinctly chocolate aroma and taste." You'll find no argument here, as a rich cocoa powder character is evident immediately upon opening. This persists throughout the drinking experience, as does an underlying sweetness which is balanced by a hint of chocolate bitterness in the finish. The beer has reasonable body, along with some chalkiness and a fair bit of carbonation, and while I wouldn't call it "stout" in terms of strength or feel, there's a good amount of flavor for a brew that fits right in with Shiner's easy-drinking style. The card goes on to suggest that Birthday Beer will return again next year, presumably keeping the same name but with the contents being yet another surprise that's "something completely different." If you're a fan of the "little brewery," I suppose that gives you something to look forward to. For now, though, this year's edition will be available in twelve-ounce bottles and cans. Seek it out wherever Shiner products are sold. After first packaging its products for retail in 22-ounce bottles, 903 Brewers in Sherman has announced plans to fully convert to cans during the early part of the coming new year. The brewery will contract with Armadillo Mobile Canning for use of their "full-service mobile packaging solution," and in the process it will become the second North Texas brewer to employ the fully removable Crown Holding, Inc. 360 End™ lid. Jeremy Roberts, who co-founded the brewery with wife Natalie, says the couple always had a preference for cans, but they didn't have the money and fermentation space to make it happen. Mobile canning operations generally require a minimum batch size and 903 wasn't able to meet the requirements with their original setup. Now, as Roberts points out, "the addition of new tanks now makes it possible." 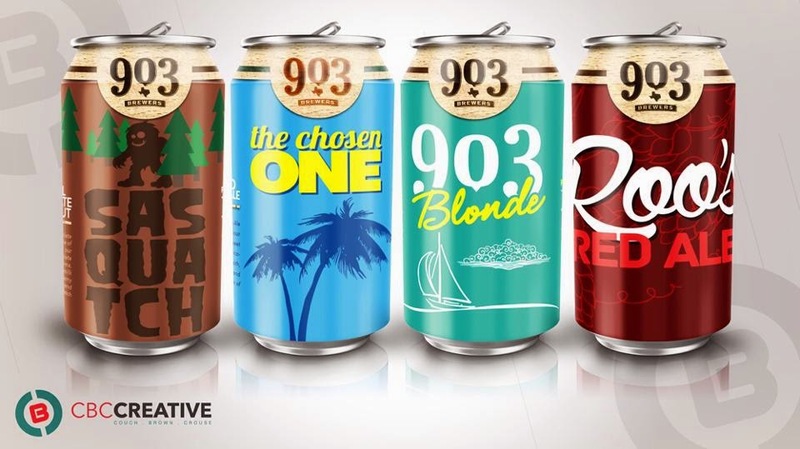 The brewery will first package The Chosen One, 903 Blonde, Sasquatch and Roo's Red Ale beginning in February, with Crackin' Up Pecan Porter, Land of Milk and Honey Stout and possibly others following in March. Roberts expects quick turnaround once they get started, as production should only take about two days. Also in the works, though it won't be sold in cans, is an as-yet-unnamed beer based on Sasquatch, the brewery's year-round chocolate milk stout. The new version will be even bigger, likely ending up with an ABV of around 14%. Roberts says the plan is to take a batch of Sasquatch and brew it with cocoa nibs soaked in vodka distilled by newly-opened neighbor Ironroot Republic. Roberts hopes to have it ready by February as well, but a final release date will depend on TABC label approval. Call it a holiday shopping list if you like, though it might also be described as a list of the books that have been stacking up on my editorial calendar. It's just the natural order of things, though, for as the craft beer community grows, so do the number of books that get released covering all aspects of the industry. That said, this certainly isn't a comprehensive list of all the books that came out this year, but it's a fair representation of releases I've spent a good amount of time reading and going over during the past twelve months. As for others worth checking out, homebrewers would surely enjoy recent editions of The Complete Joy of Homebrewing (fourth edition) and The Homebrewers Companion (second edition) by Charlie Papazian, while history buffs might like to pick up a copy of, oh I don't know, North Texas Beer: A Full-Bodied History of Brewing in Dallas, Fort Worth and Beyond. Either way, there's a little something here for everyone, whether you be a craft beer enthusiast, homebrewer, or someone looking to explore some of today's more unique and popular styles. Having set the goal to write a book that provides "actionable advice...with all the details in one place," author Michael Tonsmeire has done just that in compiling the current best practices in the still-evolving category of American Sour Beers. He begins with bits of history and terminology, along with some brief coverage on classic commercial examples, but the bulk of the book is devoted to getting you to the point of brewing your first sour beer. To get there, he takes you through the basics of wort production, spontaneous fermentation and aging, stopping along the way to draw upon the experience of industry veterans, many of whom have been brewing sour beers for over a decade. Detailed discussion and diagrams outlining the methods used by breweries like New Belgium, The Bruery, Jolly Pumpkin, Russian River and The Lost Abbey (just to name a few) give readers insights into the pros and cons of processes actually being used in a commercial environment. Homebrewing methods are covered as well, and Tonsmeire provides a set of recipes he's brewed himself, along with variations and suggested alterations should you decide take up the challenge yourself. Available in paperback and electronic form. Review copy courtesy of Brewers Publications. Although it would certainly show up in a search targeting "books on beer," Canned! isn't at all about the frothy beverage that ends up on the inside of a can. For author Russ Phillips, it's what's on the outside that matters. As he puts it, consumers can "easily go online and find out...about the beer and...the brewery that produced it." So, rather than a traditional tasting guide built around craft beers packaged in cans, his goal was to put together a celebration of the illustrators and designers responsible for creating each beer's external identity. Canned! takes what Phillips has learned and lays out cans by region, with captions providing insights into the artists and their work. The result is a fun and fascinating pictorial that, despite its topical content, has historical value in that current designs mix with those from breweries already closed. Released just in time for Christmas, Malt follows Yeast, Water and Hops in being not only one of the four fundamental ingredients in beer, but also the final installment in the Brewing Elements Series from Brewers Publications. Author John Mallett delves into the "soul of beer" by first introducing readers to Harry Harlan, whom he identifies as the "Indiana Jones of Barley", prior to taking them on a journey "from Field to Brewhouse," just as the title suggests. Take a tour of the malthouse, and then explore the machinery inside the factory that is the barley kernel as you gain an understanding of what it takes to deliver fermentable components to the brew kettle. As with other books in the series, recalling a little organic chemistry wouldn't hurt, but as Dave Thomas of Beer Sleuth LLC explains in the foreword, "the book flows" through discussions ranging from steeping and kilning to concerns with malt handling, quality and the ultimate milling of the final product. Depending on the depth of your craft beer library, you may find much that is familiar in Steve Hindy's Craft Beer Revolution. From my own archives, I noted direct references from numerous biographies and industry related tomes I've read through over the years. What makes this book different from similar accounts of the era, though, is that you're getting the story from someone on the inside. As co-founder of the Brooklyn Brewery and a longtime industry figure, he draws from his own personal experiences to complement interviews and unpublished accounts from other well-known names in craft beer to deliver a history that is both easy-to-read and unique in its perspective. Review copy courtesy of Palgrave Macmillan Publishing Company. While I'd hesitate to call anything definitive in the ever-changing world of craft beer, The Handbook of Porters & Stouts is nothing if not a comprehensive field guide to exploring the darker side of barley and hops-based libations. In addition to short explorations into the origins of porters and stouts, the authors provide tasting notes on virtually every known varietal of each. Who among you has tried Blind Bat's Long Island Potato Stout (brewed with locally-grown "organic taters") or, for the more adventurous types, Right Brain's Mangalitsa Pig Porter (brewed with pig heads and a bag of bones)? Other beers included among the over 300 covered include well-known names like Dark Lord and The Abyss, along with some that might not be familiar like Old Leghumper, Naughty Sauce and Nippletop. There's even a Temptress, though it's a chocolate porter from Australia and not the one from North Texas. Locals will, however, surely recognize one particular offshoot in The Original Pretzel Stout, from Fort Worth's own Martin House Brewing Company. Review copy courtesy of Cider Mill Press. If you've ever wondered why darker, higher-alcoholic beers age better, or why a vintage keg might taste better than a carefully aged bottle, author Patrick Dawson has the answer to those questions and more in Vintage Beer: A Taster's Guide to Brews That Improve Over Time. "Vintage Beer Rules" are provided for those simply looking for a set of basic cellaring guidelines, but Dawson also goes into the science behind these rules to provide interested readers the tools to make such decisions on their own. This is important since you are the best judge of what you want out of the beer you drink. The goal, of course, is to help you to become a more educated beer taster, something he says is "at the heart of every good beer cellar." Later chapters apply lessons learned in segments comparing fresh and aged samples of over a half-dozen world classics, while the book closes with tips on how to design and manage your own cellar. Review copy courtesy of Storey Publishing. All images the property of Cobra Brewing Company. Less than two weeks ahead of their first anniversary, the Cobra Brewing Company of Lewisville has signed with Favorite Brands DFW for distribution of their products throughout North Texas. Brewery co-founder Neil MacCuish said the decision to enter into the agreement simply stems from a desire to gain more exposure outside of Cobra's home city and "to take the business to the next level." As for Favorite Brands take on the partnership, Social Media/Event Coordinator Samantha LaMantia forwarded the following statement: "We are thrilled to welcome Cobra Brewing Company into the Favorite Brands family! Their evolving beer list is an exciting addition to our portfolio. As this is our first brewery within the DFW Metroplex, we regard the addition as a significant progression for our company. We cannot wait to share a glass of Cobra beer with DFW...and the rest of Texas." 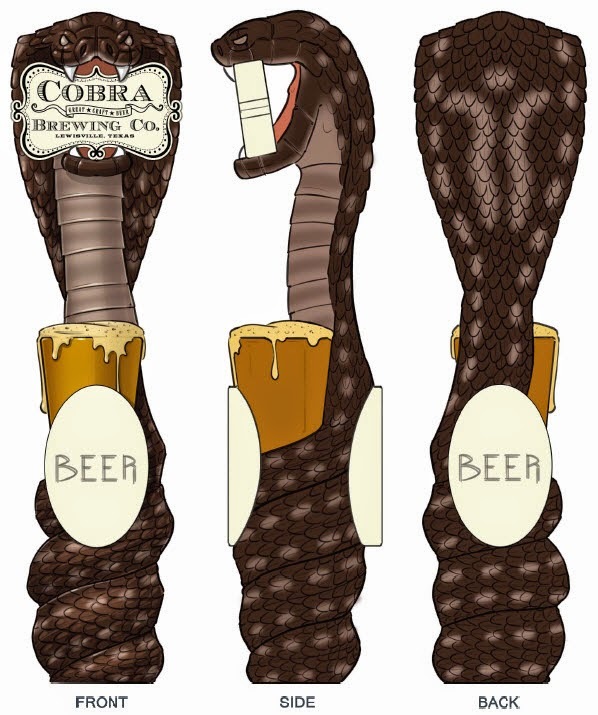 Cobra is replacing their rustic, wooden tap handles with a more distinctive design. Favorite Brands' initial deliveries will be to draft accounts, with kegs of Hoppy Dazed IPA, Best Mistake Stout and Dawn of the Dank expected to roll out before the end of the year. Part of the plan includes the introduction of a new tap handle intended to replace the rustic, wooden design currently being used by the brewery. Shown in the image above, the new handle will stand nearly a foot tall. This, along with its distinctive look, should allow it to stand out and make it easier to identify Cobra brews on tap in an increasingly crowded marketplace. Dawn of the Dank, incidentally, will be released with a slightly new formulation designed to increase the ABV of the Imperial IPA from 8.5 to 10.5%. That beer, along with Best Mistake Stout and the seasonal Angry Leprechaun, will also find its way into 22-ounce bombers targeted to arrive at retail in the February to March time frame. Other beers will follow based on demand and production needs. Preliminary bottle label designs for Cobra bombers. Leading up to all of this, Cobra will upgrade their brew kettle and add more fermenters to boost supply. The upgrades will double the brewery's current capacity and enable them to brew 10-barrel batches. This, MacCuish notes, was a necessary move if for no other reason than the fact that they've already sold the beer currently in production. 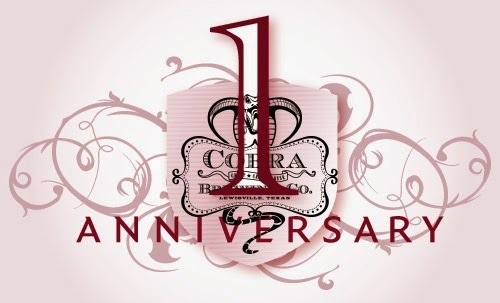 Cobra will hold an anniversary celebration at the brewery on Saturday, December 20 at 1 p.m. At least eleven beers will be on tap, including a Hazelnut Coffee Porter and rum barrel-aged editions of Hoppy Dazed IPA and Nitemare Before Xmas (these last two beers will be VIP only). MacCuish is also working to install a new nitro tap in time for the festivities, something that'll be used to dispense either Best Mistake Stout or Cobra's Old Town Pale Ale. The main attraction, though, will likely be an anniversary brew called The Kitchen Sink. This Imperial stout boasts an ABV of between 13-14%, and is brewed with vanilla beans and cocoa nibs soaked in bourbon from the neighboring Witherspoon Distillery. Tickets for the event can be purchased in advance via Eventbrite. A VIP option gets you early entry, exclusive access to barrel-aged beers and special glassware. There will be vendors on site, including Union Growler and Junior's Lone Star Sauce, along with live music from The Whiskey Prophets and The Rhythm & Beards. Check the brewery's Facebook page for updates and additional details. It all started back in July, when the Community Beer Company announced the pending release of a new, but as yet unnamed, Russian imperial stout. The brewery canvassed the public for help in naming the new brew, revealing a few weeks later that it had narrowed the choices down to a winning entry submitted by Ben Bascombe. As for the name of the new beer, it would simply be called Legion. What they didn't tell us right away, was that in the time leading up to the beer's debut at the end of September, they had put a portion of the batch into spent bourbon casks in anticipation of a barrel-aged release to come later in the year. As you've probably already heard, that time is now. Following two nights of sneak preview tastings at the Community taproom, bottles of Barrel-Aged Legion are set to go on sale next week. Lone Star Beverages in Carrollton has been chosen as the official launch point for the release, and co-owner Rick Ali tells me they'll be getting a significant allocation in the neighborhood of 40 cases. Noting the established success the original Legion offering, Ali says he's "excited to be a part of this release" and for subsequent products Community will be putting out with their new Barrel-Aged Series. 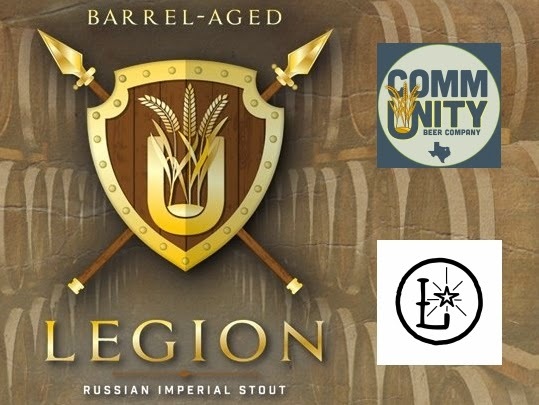 He also recognizes the synergy of partnering with the brewery for this event in saying, "Lone Star has long been a part of the growth of the craft beer scene here in North Texas, and being chosen as the first to offer BA Legion to the public only strengthens the drink local and shop local movement!" Regarding the beer, which I'm told was aged in barrels from Heaven Hill, I can tell you that a first impression may have you nicknaming it "Woody." While Barrel-Aged Legion is bourbon-forward on the nose with additional elements lingering in the background, the wood and vanilla characteristics are much more predominant when it comes to the taste. The heavy influence of the wood also gives the beer a dry and tannic finish, something which lingers along with hints of underlying roast well into the aftertaste. So, should you drink it now or drink it later? In answering that eternal question, let me just say that the barrel character is strong in this one. My personal preference would be to give it additional time in the cellar, but of course that choice is up to you. Lone Star will sell four-packs of twelve-ounce bottles on Monday, December 8. Twenty cases will be released at 9:30 a.m., with an additional twenty going on sale at 4 p.m. (quantities will be limited to two four-packs per person). Visitors to the shop can also expect free tastings of Legion (note samples of Barrel-Aged Legion will not be available), as well as "deep discounts" on that beer and what is arguably Community's flagship, Mosaic IPA.